Welcome to 2013. In March of this year, comScore said that there were more than 136 million smartphone users in the United States alone. Is it any wonder that people are using their mobile devices to search for the businesses that they want to patronize, as well as the products and services they want to buy? When it comes to marketing, mobile is no longer an option. If you want to be always in front of your customers' eyes, then you need to be doing more mobile marketing than a year ago. 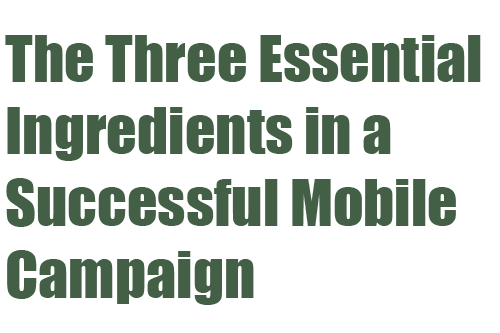 The first step to any mobile marketing campaign is to mobilize your content. A mobile Web site is very essential as it provides a way for your customers to find you on their mobile devices. What's more, you will be able to present your business, products and services in the best way possible. The good news is that it is now very easy to come up with a mobile Web site. You no longer need to know HTML5, programming and other technical stuff. You also do not need to know the best practices in creating a mobile Web site. There are tools that can help you create a working and beautiful mobile Web site in just seconds. Check out AzonMobile's Mobile Web Builder and experience quick and easy mobile Web site creation that looks like it was written by professional Web designers but is actually a drag and drop affair! Of course, you simply cannot go purely mobile. You will still have to have an ad in the newspaper or in magazines. You will still need to put up flyers all over town or have signs in your store. You will still need a business card to give new contacts. However, you can make all of these printed marketing materials work a lot better with QR codes and near-field communication technology. Both of these technologies help you bridge the offline world with your online properties. They can take people to your mobile Web site, for example, without them tapping a long URL on their smartphones. QR codes and NFC allow you to offer your customers great content conveniently and at a very low cost! People are using mobile devices to access their social media accounts and keep up with friends. If you want a strong mobile presence, then you should have a strong social media presence. Just take a look at the numbers. In January of this year, Facebook reported that around 157 million people used their mobile device to check on their Facebook accounts. CNN reported at that time that more people are checking Facebook on mobile than on desktop. By March, that number climbed to more than 750 million. Facebook also reported that 30% of the revenues come from mobile. It only makes sense to have a great social media presence, especially on Twitter and Facebook. This is probably where most of your customers and target market are!